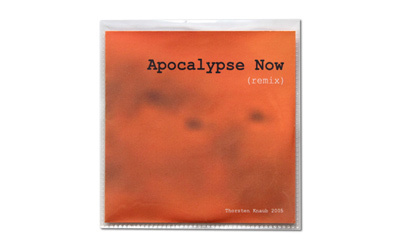 CD Edition of 50, 23'58"
Apocalypse Now (remix) takes an extract of the audio track of the movie 'Apocalypse Now'and puts it through repeated digital manipulations - first repeatedly speeded up and then subsequently slowed down again and again back to the duration of the initial extract. As a consequence the increasing space/time is filled with less and less available information and replaced by digital interpolations. The 'stretched' sound acquires new textures through this process. The manipulated section is the helicopter attack scene set to Wagner's Ride of the Valkyries. One interest here for me is to create listening experiences using 'found' material and using no instruments. 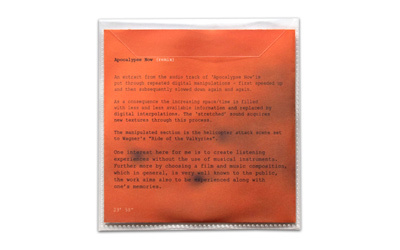 Further more by choosing well known film and music composition, the work also aims to explore our collective memories.